Hugh A. D. Spencer�s weird, wonderful, side-splitting short fiction has been delighting audiences for over 25 years. His stories have been published in a variety of magazines and anthologies and broadcast on National Public Radio satellite networks. Now collected together for the first time, Why I Hunt Flying Saucers And Other Fantasticals contains thirteen of his best-loved stories, along with all-new introductions by the author. Malfunctioning household robots, an endless apocalyptic loop, potash-fuelled interstellar travel, and more�these stories stretch science fiction to its limit and bring it into our backyards at the same time. 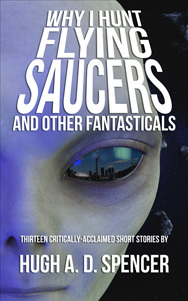 Includes the Aurora Award-nominated story �Why I Hunt Flying Saucers�!